Although the name appears unusual now there was quite a fashion for naming children after royalty at this time. The first King George came to the throne in 1714 and subsequently the George family had this naming pattern for several generations. Prior to this there were several Prince Georges around the St. Albans area. Either this was a popular fashion or the Prince Georges and King Georges are related. William King George was born in 1721 in St Giles Cripplegate, London and was baptized at St. Botolph without Bishopgate. He died February 23, 1784 in London. He married Elizabeth Seaton on October 28, 1750 in Saint Benet Fink, London. She was born 1724 in Shoreditch. Together they had 8 children all baptised at St. Leonards, Shoreditch. At the time they were living in Holywell Street., Shoreditch. 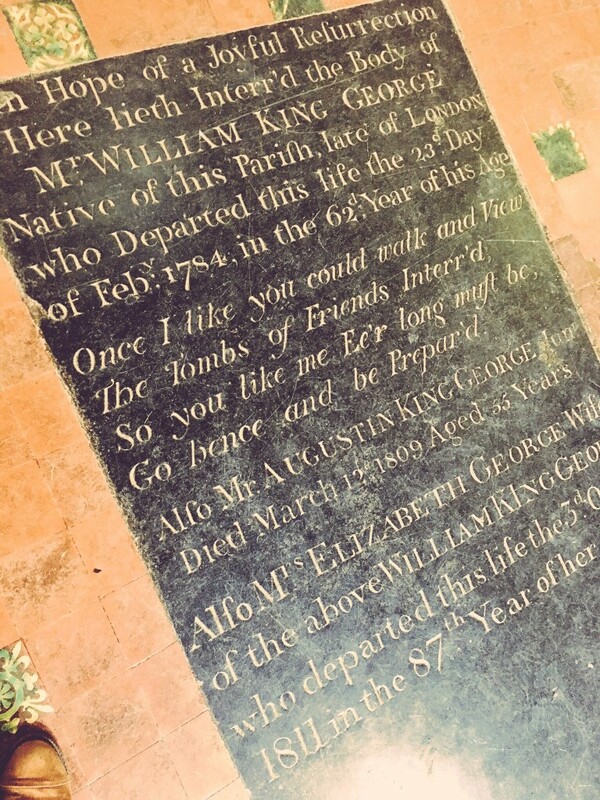 As there was mention of only 2 children, Augustin and Ann in his will it is likely that the other children died in infancy, as may be assumed by the repetition of the names William and King. It is apparant that they were all deceased by 1781. 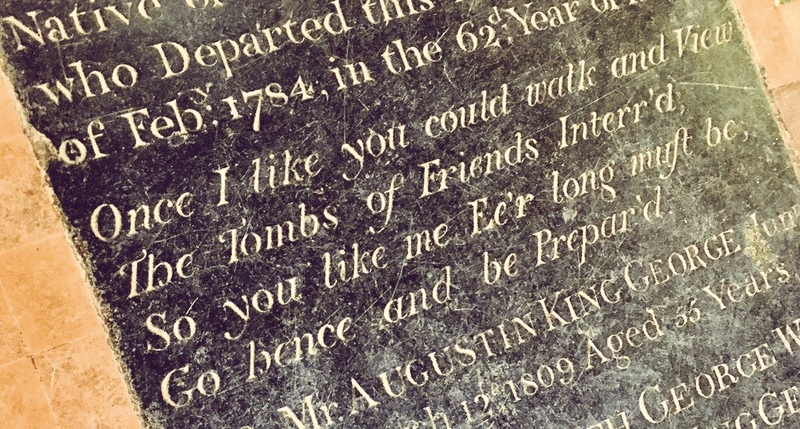 This black ledgerstone can be found in St. Alban’s cathedral clearly following requested written in his will which states that he is to be “buried in the Abby Church of St Albans with a black marble slab over my grave”. The will also instructs his son to ” pay the Rector Churchwardens and Overseers of the Abby Church of St. Albans such sum as will purchase 100 pounds in the 3% consolidated Bank Annuities which I direct to be invested in their names”. William King Georges will indicates that he was a wealthy man who was providing for his nephew Jeremiah Couzins during his apprenticeship and he left his sister Martha Peace a modest annuity. He left the bulk of his estate of several thousand pounds to his wife, his son Augustin King George and his daughter Ann Gratton nee George. of Feby 1784 in the 62d year of his Age. Go hence and be Prepar’d. Also MR AUGUSTIN KING GEORGE, Junr. Died March 12, 1809 Aged 55 (35?) Years. 1811 in the 87th Year of her Age.